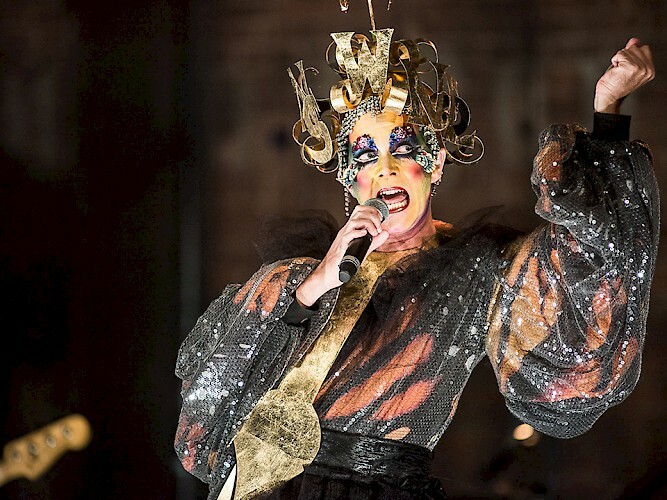 Ever since we got to see Taylor Mac perform a portion of A 24-Decade History of Popular Music at Curran Under-Construction we couldn’t wait for the full show to come back. Last Friday the wait finally ended, and we got to see the first six hour chapter of the show at the Curran- covering the first six decades of American history from 1776-1836. It made for some unforgettable Drama Talk & Drinks. Katie: Crazy, right! I was worried it was going to brutal, but it wasn’t at all. It went fast. B: It went so fast! I was surprised every time an hour ended. B: I had some anxiety going into the show. The idea of going into a six hour performance that doesn’t have any intermissions is kind of daunting. I was worried about having to pee, getting tired, getting hungry, getting bored. All of those things were taken care of, so none of that was a problem. It would be very easy for them to just be like f*-you it’s performance art, you’re supposed to be uncomfortable, but it’s clear they really cared about taking care of the audience. K: It was also just an amazing show. I loved it. So unique, so fun, so engaging. B: I’ve never seen a show like it, so I can’t even go about comparing it. Taylor is an amazing performer, so expressive, such a fabulous voice. K: I feel like this show made performance art so accessible. From the way Taylor engaged with the audience and shared personal stories, to the amazing costume design by Machine Dazzle, to the more contemporary arrangements of these historical popular songs by Matt Ray, the whole show felt so deeply relevant. It was fabulous, irreverent, smart, intellectual, artsy, and still deeply human. I was able to connect to it. Not like other performance art I’ve seen that I’ve felt alienated from. B: The Curran is such a big space too, and somehow they managed to create a really intimate experience. They did audience participation better than any show I’ve ever seen. Taylor even called it out, that audience participation can be really uncomfortable. Somehow they managed to create a space where it was just fun. They kept pushing audience boundaries, asking us to do stranger more intimate things, and by the end it truly felt like the audience was part of a community and building the show together – which is an amazing thing to accomplish. K: What an undertaking. I can’t even imagine there’s so much more of this show to go. B: I know! I thought I would be done after six hours, but now I really want to go back and see the other nights. Especially the last two installments which will have more contemporary music I’m more familiar with. This show does such a clear-eyed job deconstructing the history of oppression in America, and it would be fascinating to see songs I know turned on their head. The Verdict: Go see this show! It’s one of the most remarkable pieces of theater we’ve seen. The Drama Talk: Taylor opens the show telling the audience this is a “radical fairy realness ritual” and there isn’t really a better way to define it. Part drag performance, part concert, part performance art, part history lesson this show can’t be put into a box. It was workshopped over three years, in various configurations in New York. Culminating last year in a 24-hour performance of the show in full at Brooklyn’s St. Ann’s Warehouse. This San Francisco production, a collaboration between the Curran, Magic Theater, Stanford Live, and Pomegranate Arts (Taylor’s home theater) is the first showing where they’ve broken the 24 hour show into four six-hour blocks (1776-1836, 1836-1896, 1896-1956 and 1959-present) and shown it in its entirety over multiple days. It’s a remarkable testament to the company’s talent that six hours felt like no time at all. Using popular music from each decade Taylor explores the history of America and the systemic oppression which has been foundational to our society. All of this is done with such heart and levity, that you don’t even realize how deep the content is until you leave the theater. A really remarkable performance that you should see if you can. The Drinks: The Curran sells drinks and food throughout the show, which you can bring into the theater, so that’s what we did. Each night is different, but there was both food and drink handed out to the audience by the Dandy Minions during the performance we saw as well, so you will be well taken care of. Just remember to pace yourself. In one moment this show feels like a raunchy drag performance, in the next it’s tackling issues like racism and sexism, so you don’t want to be wasted and miss some of the really smart critiques this show has to offer. The last two chapters of this show are this coming weekend, (September 22 & 24) so if you want a chance to experience this amazing performance you need to go now. Tickets range from $285 to supposedly $49, but the cheapest we could find for single ticket purchase remaining were $99 tickets. You can buy tickets through the Curran website. Drama Talk & Drinks: An American In Paris - "who is this musical for?" Drama Talk & Drinks: A 24-Decade History of Popular Music "a radical faerie realist ritual"